That’s right. Canadians play the comics game too. Just check out the sweet Living Between Wednsdays blog headed up by our friend and guest for this weeks show Rachelle. 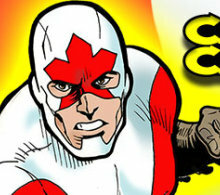 Join Adam, Brian, Rachelle, and Ted, yep, Ted, as we discuss Canada’s contributions to the comics we love.